Economics has long labored under the misnomer, the dismal science, yet Entrepreneurial Economics shows that it is anything but dismal! Economic thinking is indispensable not only for understanding the world of human affairs, but also for improving it. Entrepreneurial Economics ingeniously applies simple economic principles to improve our health, wealth, security and happiness. Leading scholars take on the problems of genetic testing, patents, health and wealth insurance, legal gridlock, probation and parole, urban transit, intelligence gathering, bankruptcy, investor protection, and even the shortage of human organs. Entrepreneurs, reformers and visionaries have often turned a blind eye towards economics, only to see their efforts fail. 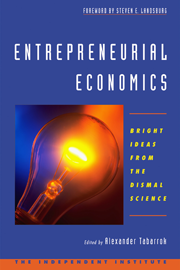 Entrepreneurial Economics now provides the crucial economic insights for any endeavor. Entrepreneurial Economics gives students valuable insights into the power, scope and relevance of economic thinking; inspires economists to bring the tools of their trade to bear on a wider range of problems; offers promising new solutions to social problems built upon time-tested principles; encourages business people to identify innovativeand potentially very profitableideas waiting for entrepreneurship and provides anyone with an intriguing, inspiring and irreplaceable resource for seeking real solutions to complex social problems. Want to really change the world? Entrepreneurial Economics clearly demonstrates how practitioners of the dismal science are doing just that.